A fantastic email came in today that was so good that I dropped everything else I was doing to address the question at hand. 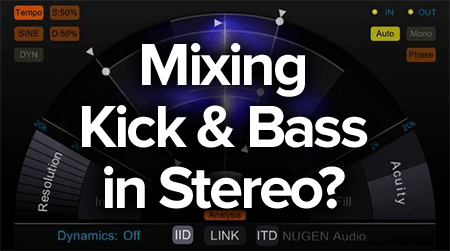 The question involves the information found in one of our most popular and earliest articles called Mixing Bass and Kick for Low-End Balance. With nearly every genre now emphasizing the low-end to drive the groove and create the sensation of power and anticipation, it's only right that we return to the topic one more time. We'll be adding a summarized version of this answer into that main article soon, but in the mean time let's dig in with some depth right here. Stereo vs. Mono for Bass & Kick Drum? I just read the column "Mixing Bass and Kick for Low-End Balance." I know this was written a few years back, but the information is timeless. Wonderfully done. All very sound advice that, even after 10 years of mixing, I'm still learning from it! With all of the info focused on bass and kick, I would have liked the author's opinion on Stereo vs. Mono for both. Should we be narrowing the stereo image instead, rather than it being fully mono? Or, is there a way to send certain frequencies to center/mono while leaving others more in the stereo image; particularly with bass? DB, thanks for your kind words. This is Jared, the author of the column. I'm glad you brought this up, since I didn't realize I didn't touch on this in the main article. What I previously said was that your kick and bass should both remain dead center in the stereo field, mainly because you need both speakers, whether this is headphones or studio monitors, sharing the burden of pumping out these highly energetic low frequencies. Often this is responsibility is pushed to a subwoofer, but you can't really use panning with a sub either, nor will your listeners generally have access to one as they go about their lives. If you offload too much of the weight on one speaker or the other through panning, you risk a bit of unequal distortion on one side which can then throw off the rest of your mix with phase issues and other problems in the balance of the stereo field. For these reasons, it is essential, even critical, that you always keep these bass frequency elements of your song centered in the stereo field. 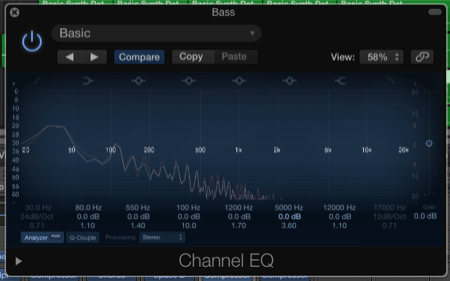 Compare the image above to the similar image below showing a proper stereo bass that doesn't damage the mix. What About Using Reverb on Bass and Kick? If you dig hard enough, you'll find instances of reverb being used on these two instruments. But what you'll be wading through in your quest is the large majority of mixers suggesting you leave both completely dry, which is to say that you shouldn't use reverb on them at all. The reason is that it's already hard enough to create intelligibility in the bass regions. Once you add reverb you start to smear the sound out across time. Even if you add a large amount of pre-delay so that you maintain that intelligibility, you'll still be restricted to a short-tail reverb and that may not be what the song calls for. You'll also be adding a lot of mud to the song in the process. In another article I wrote concerning mixing with reverb, I explain how you should place your reverb on an auxiliary bus which can then be equalized so it's only filling in the spatial gaps and not interfering with the clarity you already created. You can attempt this, using a stereo reverb that fans out across the stereo field, in the context of the bass and kick, but I'd recommend against it. It requires too much surgical equalization as opposed to the next method. Reverb also makes an instrument seem like it's sitting further back in the mix, which gives the listener the sense that the volume has been turned down. Your bass region needs to be the second loudest region of the mix behind your vocals, and perhaps your snare drum depending on the mix. I never apply reverb in this fashion, but your mileage may vary. It's worth the experimentation though. So far I'm suggesting to keep the bass and kick drum centered with no panning, with the goal being to distribute the energy load across the two speakers evenly. I'm also saying not to use reverb in order to maintain as much clarity as possible in the low-end, which you'd roll most off of using EQ on the reverb bus anyways. But obviously, as you point out, both the bass and the kick drum don't entirely live in the sub-bass and bass frequency regions. In fact, quite a bit of their character is in their harmonics that extend up to the mids and higher areas of the frequency spectrum. In the image below you can see that this particular bass has harmonics reaching up to 4 kHz or so. These harmonics don't pack such an energetic punch that it matters if they stay completely centered. It's the same reason we're able to pan every other instrument around. Even at extreme volumes they don't require the same acoustical energy demands on the speakers. 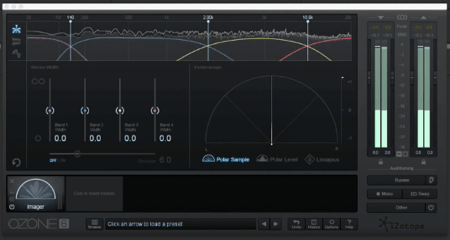 There are plenty of tricks to gain stereo width on an instrument. You can use a stereo reverb like we mentioned before. You can duplicate a track, hard pan the original left or right, and hard pan the duplicate in the other direction and pitch shift it by a few cents while adding a 30 millisecond (or so) delay to it. But there's a better trick that works extremely well for bass, especially synthesizer bass, and that is to use the chorus effect (you can use a flanger or phaser, too). This can be done with the kick drum as well, with a lot more caution though, aiming at less added width. In our case, we want to use a stereo chorus effect. What it does is split your mono bass signal into two independent channels that are then panned hard left and hard right. The chorus software or hardware will then begin oscillating the pitch and a small amount of delay differently in each channel, usually in an inverted relationship versus any true randomization. The amount of delay added indirectly changes the sense of panning as well. The end result that your bass gets stretched horizontally across the stereo field instead of being a mono element exclusively up the center. But you're not done here, because otherwise you're creating the same issue you would have with panning. You need to add your chorus effect on a bus so you can control every aspect of it like you would any other instrument. 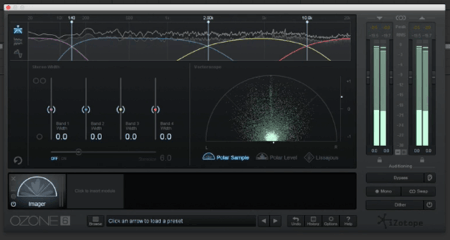 The two attributes you want control over is the volume and the equalization. Regarding volume, you don't want this chorus effect being too loud. You want it subtle without introducing possible phase issues. Your goal is to provide stereo width, not a noticeable sound effect. As for the equalization, this is the most important part of using this chorus effect. You want to apply an EQ plugin to the bus so you can use a low-cut / high-pass filter on it so none of the sub-bass and very little of the bass region makes it into the chorus. You only want the harmonics spreading out across the stereo field. A suggested starting point would be 350 Hz to 400 Hz and sweep upwards from there till you find the sweet spot. What this will do is give the listener the exact same impression of width as it would have otherwise, but without the inclusion of the sub-bass and bass frequencies which would cause other issues. The harmonics are the characteristics the listener will latch on to, while the bass will still provide that non-localized thumping power that's shared across both speakers equally.